In today’s economy and society mobility is of high significance. People want to arrive at their destinations comfortably and quickly. Goods have to be moved economically over long and short distances. Consequences of mobility show themselves in pollution, accidents and traffic jams. 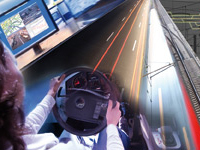 We develop solutions for these challenges for a safe and efficient mobility of the future.